Twin line (open wire line) Surge Arrester. 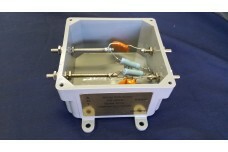 AS-309H - Open Wire Line Arrestor - Twin Line Surge Supressor. Needs ground connection. 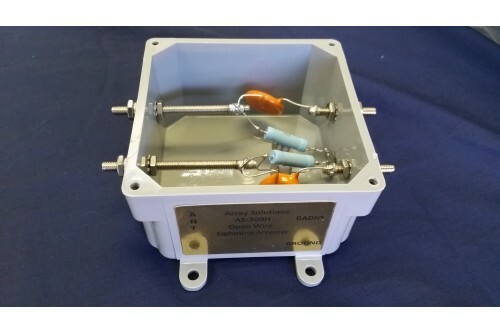 Based on the design by Industrial Communications Engineers (ICE) 309H coaxial arrestors, these arrestors have been improved in performance, packaging, and hardware. These arrestors are DC blocked and include static and DC discharge capability just like the famous ICE arrestors. They also include rated Gas Discharge Tubes (GDT) which can be replaced (NOTE: Recommended GDT voltage rating: 2700 V) with simple tools. Due to the static bleed components inside the arrestors not only does it help to keep the tube from firing extending the life of the GDT, but by virtue of bleeding off static that is charging the coaxial cable it eliminates cable discharge noise from the sensitive receiver which can lower the noise level heard. 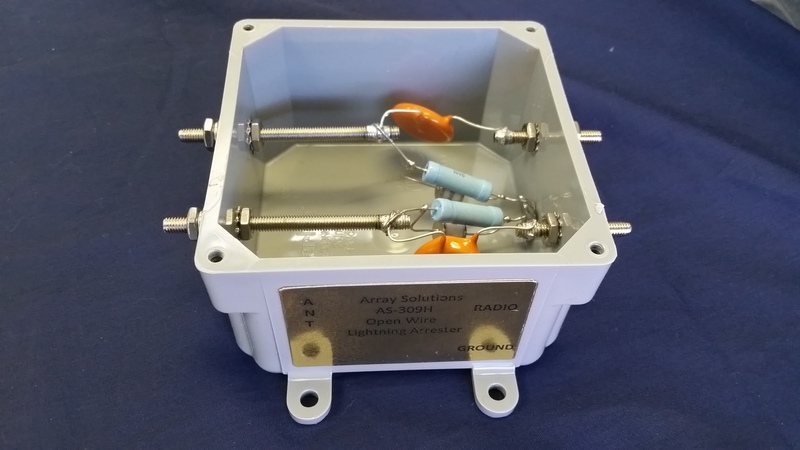 The AS-309H is designed for use with open single wire, or open twin wire transmission lines. They can handle Zo line impedances from 300 to 600+ ohms. The are meant to be mounted at ground level near the lightning grounding system.